Scholl Velvet Smooth Wet & Dry Rechargeable Foot File 1 item order online. Silky feet in an instant - anytime, anywhere! 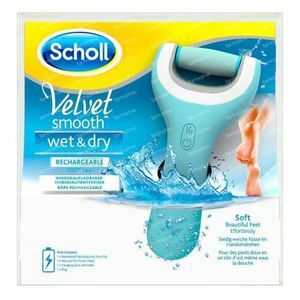 Velvet Smooth wet & dry * foot file is rechargeable, wireless and can be used dry, in the bath or shower. With its specially designed roller, which can be used on dry or damp skin, he makes your hard skin effortlessly smooth. Move the foot file gently on the hard skin and see how easy it is removed. Works both on a dry or damp skin. Rechargeable foot file. Silky feet in an instant. After one use. Shut off the foot file and clean it under the tap. Dry it with a clean dry cloth and store in a cool, dry place out of the reach of children. This foot file is not suitable for people who suffer from diabetes or have poor circulation. For use on hard skin on feet only. Don't use the foot file on other body parts. Use only for the intended purposes. Keep away from children. Don't use more than 3 to 4 seconds on a specific area. Immediately stop in case of irritation or discomfort. Do not use on damaged, sore or irritated skin. Always be wary of risk of slipping when the product is used in a wet environment. Do not immerse the foot file under water for long periods. To charge the battery, only use the detachable power supply unit supplied with this unit. The foot file may only be used with the docking station included with this product. Don't use the foot file while charging. Remove the foot file of the charging station before cleaning it in water. The charging unit is not waterproof: do not charge near water, do not immerse in water and do not use with wet hands. The cable can not be replaced. If the cable is damaged, the appliance should be scrapped. Keep long hair and clothes from the vicinity of the foot file when it is in use. Item arrived for collection at my local Halfords Store and I was emailed every step of the entire transaction which was smooth and without a hitch from start to finish. Easy online ordering. Very impressed so will definitely buy further products from this store. Oh forgot to mention the price was the cheapest I could buy online. The foot file works well to remove calluses, best to use it quite regularly to maintain results and in combination with callus cream. Delivered promptly in a secure packaging to avoid damaging the product.